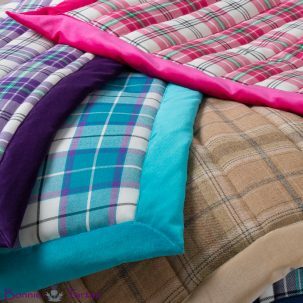 From our beautifully quilted vibrant tartan and tweed wool throws trimmed with sumptuous velvets to our tartan and tweed accented pure wool cushions, all designed and handmade by us in Scotland. We offer to you a new soft furnishing collection presented in our Bonnie & Thistle Tartans, along with our carefully selected tweed ranges. Bespoke custom soft furnishings are available upon request. Please contact us. 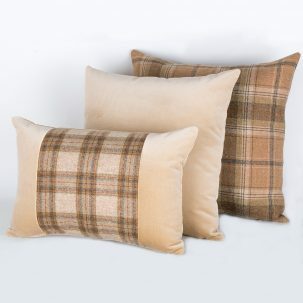 The finest Tartan and Tweed Wool cushions and accent cushions available in hollowfibre or feather filled. Beautifully crafted Quilted Throws available in tartan or tweed. Designed and made by Bonnie Tartan. Luxury bedding sets made with pure wool available in tartan or tweed of your choice.